This year (2013) marks the 101st year anniversary of the National Cherry Blossom Festival in Washington DC. In 1912, Japan gave 3,020 cherry blossom trees to the United States as a gift to celebrate the two nations growing friendship. These trees replaced an earlier gift of 2,000 trees which were damaged and destroyed because of disease in 1910. These trees were planted around the shore line of the Tidal Basin in Washington, DC. In 1965, the gift was renewed with another 3,800 trees. The cherry blossom trees continue to be a popular tourist attraction when they reach full bloom in early spring. In Japan, the flowering cherry tree or "Sakura," as it is called by the Japanese people, is one of the most exalted flowering plants. The beauty of the cherry blossom is a potent symbol equated with evanescence of human life and epitomizes the transformations Japanese Culture has undergone through the ages. The date when the Yoshino cherry blossoms reach peak bloom varies from year to year, depending on weather conditions. For the past century, people from all over the world have gathered in Washington, DC to welcome the arrival of spring and to share the special season with each other. This year the National Cherry Blossom Festival will last five weeks to celebrate the 100th year anniversary of the cherry blossom trees in Washington, DC. The splendid cherry trees, the focal point of the Cherry Blossom Festival, are constant reminders of the strong and enduring friendship between the United States and Japan. Visit our DC Gift Shop for Official National Cherry Blossom Gifts & Souvenirs. Read and Submit questions or messages about Cherry Blossoms at the Washington, DC Cherry Blossom Discussion Page. This year celebrates the 100th year anniversary of the 1912 gift of the cherry blossom trees by Japan. The Cherry Blossom Festival will last an epic five weeks this year as opposed to the normal two-week period. From the Opening Ceremony and the Smithsonian Kite Festival that kick off the Cherry Blossom Festival to sushi tasting, Japanese street festivals, a 10-mile run, fireworks, and daily cultural performances at the Tidal Basin stage, there is something for everyone to enjoy and celebrate springtime in our Nation's Capital. The National Cherry Blossom Festival is an annual commemoration of the gift in 1912 of 3,000 cherry trees by Mayor Yukio Ozaki of Tokyo to Washington as a memorial of national friendship between the United States and Japan and a celebration of the continued close relationship between the people of the two countries. The Sakura Matsuri Japanese Street Festival is the final major event of the National Cherry Blossom Festival in Washington, DC. It is the biggest Japanese street party in the nation. The Cherry Blossom Parade is an exciting traditonal moment for Washingtonians. The Parade is made possible by the extensive volunteer efforts of the Downtown Jaycees, in cooperation with the National Park Service, and The District of Columbia�s Mayor�s Office. Embassy of Japan Princess, Miss Maya Kobayashi opened up the 1999 Cherry Blossom festival by lighing a symbolic 300 year old stone lantern. The lantern was given to the United States in 1951. A new tradition was born at the President Taft graveside in Arlington Cemetery. A distinguished Japanese goodwill delegation expressed their gratitude and honored the Taft family and by simply planting an American Dogwood tree. At the end of the week is the National Cherry Blossom black-tie Gala. This is when the coming year's National Cherry Blossom Festival Queen is crowned. The crown was crafted by the Mikimoto Company and presented to the Festival by Yoshitaka Mikimoto in 1957. The crown took fifty continuous days to complete and has 1,585 pearls personally selected by Mr. Mikimoto and they are set in a frame of 14K gold. The crown has a 6-3/4 inch base that is encircled with a band of ermine. Above the base is a coronet of perfectly matched pearls and delicately crafted gold blossoms, scrolls, and leaves. All proceeds from the fashion show went to: Kennedy Institue to Mentally Challenged Children, Love for Children, and NIH Ronald MsDonald House. You can visit Inga's boutique, "Once is Not Enough" at the palisades on 4830 MacArthur Blvd. in the District. The Cherry Blossom Festival provides a rare opportunity for pangeant princesses to visit the Japanese Embassy and learn about Japan's culture. The highlight of the afternoon was a special Tea Ceremony done to honor the Cherry Blossom Princesses. Everyone in DC looks forward to the first cherry blossoms heralding the arrival of Spring in the city. Many people head down to the Tidal Basin on their lunch breaks to escape the office and enjoy the view. Every year Ms. Ikeda, now Vice President and Cultural Liaison for the National Cherry Blossom Festival, invites Master Sushi Chefs to come from Japan and give a free demonstration of their skill (and a tasting!) at Phillips Flagship Restaurant on the Waterfront. Images help us remember special days and events. Come along on our journey as we capture memorable times and places in our Photo Galleries. 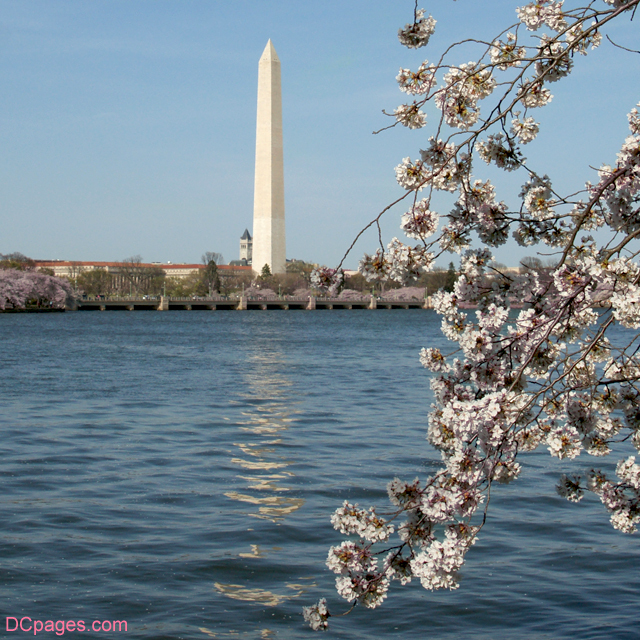 Beautiful images of the Cherry Blossom trees around the Tidal Basin. See these cherry trees from bud to blossom in Washington DC's best image gallery of these famous trees highlighting those surrounding the Jefferson Memorial and Washington Monument. View these magnificent pictures of the Cherry Blossom trees in full bloom during the 2010 Cherry Blossom season. There are multiple images of these famous trees surrounding the Tidal Basin highlighted by beautiful images of the Jefferson Memorial and Washington Monument. This gallery monitored the bloomming period of the Cherry Blossoms from different locations surrounding the Jefferson Memorial and Washington Monument in Washington, D.C. from March 24 - April 6, 2009. This gallery features photos following the cherry trees from bud to blossom. These daily photos feature the Washington Monument and jefferson memorial in the background. This gallery monitored the bloomming period of the Yoshino cherry trees around the Jefferson Memorial in Washington, D.C. from March 22 - April 4, 2007. This gallery monitored the bloomming period of the Yoshino cherry trees around the Jefferson Memorial in Washington, D.C. from March 22 - April 4, 2006. This gallery monitored the bloomming period of the Yoshino cherry trees around the Jefferson Memorial in Washington, D.C. from April 10 - 15, 2005. This page monitors the bloomming period of the cherry trees around the Tidal Basin featuring images of the Jefferson Memorial in Washington, D.C. from March 27 - April 2, 2003. Many people have called DCpages.com and inquired as to where they can purchase Japanese flowering cherry trees to plant in their own yards. This is understandable, as the cherry trees in downtown DC are such an incredible site it attracts visitors from around the world every year. It is indeed a surreal site to behold with tens of millions of white flower petals with the palest of pink hue floating from 5 to 60 feet off the ground. It feels as if you are walking through a cloud of flowers and yes, it is that good. There is a local company called CherryBlossomGift.com that sells three different types of flowering cherry trees: the "Yoshino," the "Kwanzan," and the "Weeping Cherry." The Yoshino tree is a flowering (rather than fruit-bearing) hybrid whose origins are not known. Due to its hardiness and beauty it is one of the most popular flowering cherry trees planted world-wide and can grow up to 40+ feet tall and live over 75 years. The Kwanzan flowering cherry tree, a.k.a. Japanese Cherry, Hill Cherry, Oriental Cherry or East Asian Cherry, is a species of cherry native to Japan, Korea and China and is the second most popular tree planted in West Potomac Park on the Tidal Basin in DC. Rather than the pale white of the Yoshino, the Kwanzan's blossoms are deep pink. The third kind offered is the Weeping Cherry. Natives of Japan, weeping cherry trees have long, drooping branches akin to weeping willows. In the spring, the Weeping Cherry is covered in white to pale-pink blossoms. Although a weeping cherry tree's vertical growth rate is moderate, the growth rate of its numerous weeping stems can be very fast. According to research, these trees will grow in every state in America except a handful of states in the upper Mid-West and Hawaii. They will grow in southern Alaska. CLICK HERE to view our FREE printable version of this map in Adobe Acrobat PDF. CLICK HERE to view our FREE printable version of this map in JPEG Format. The National Park Service is asking private citizens and organizations to donate funds to allow for the replacement of the cherry blossom and other shade and flowering trees. In 2003, the National Park Service established the National Capital Region Cherry Tree Replacement Fund. The purpose of the fund is to provide reliable, significant monies on an annual basis, in perpetuity, to supplement funds appropriated by Congress for the replacement and maintenance of the cherry trees. As an endowment fund, only income can be dispersed. The principle remains intact. The National Park Foundation manages the fund for the National Park Service under the Foundation's Board-approved investment guidelines. The National Park Foundation is the Congressionally chartered non-profit partner of America's National Parks. To find out how to support the Cherry Tree Replacement Fund please contact Glenn Eugster, Partnerships Office, NPS-National Capital Region at (202) 619-7492. The International Cherry Blossom Festival in Macon, Georgia has grown from a three-day festival with 30 events, to a 10-day celebration featuring hundreds of events planned to entertain all ages and backgrounds. Celebrated in late-March, the festival clebrates the town's more than 300,000 cherry trees making it the largest collection of cherry blossoms in the United States. Balboa Park in San Diego has 2,000 cherry blossom trees that blossom in mid-to-late March. Lake Balboa in Los Angelas has over 2,000 cherry blossom trees that originated from a single parent tree. These cherry blossom trees were donated by an anonymous Japanese benefactor. The trees were planted in 1992 and were developed to grow in warm climates. Fairmount Park in Philadelphia has over 2,000 Japanese cherry trees. In 1926, the Japanese government gave the city a gift of roughly 1,000 trees in honor of the 150th anniversary of American Independence. The other half of the cherry trees were planted between 1998 and 2007 by the Japan America Society of Greater Philadelphia. The blooming of these trees is celebrated with the annual Subaru Cherry Blossom Festival of Greater Philadelphia. Branch Brook Park in New Jersey has over 4,000 cherry blossom trees in more than fourteen different varieties. They celebrate an annual Cherry Blossom Festival in April that attracts thousands of visitors from across the country and the world. Based on an ongoing replanting program the park will soon have more cherry trees than Washington, DC. Brooklyn Botanic Garden in New York City also has a large annual Cherry Blossom Festival or Sakura Matsuri. The festival showcases the cherry trees and offers over 60 events and performances that celebrate Japanese culture and heritage.